Please visit Osaka, Japan to see an important event. When you decide to attend this show, please pre-register at this page to save 1,000 yen registration charge on-site. NIPPON COKE & ENGINEERING CO.,LTD. Both of the exhibitions can be attended for free admission if you register on-line in advance at Japanese web page. We are happy to assist you for your international registration. Please contact us. 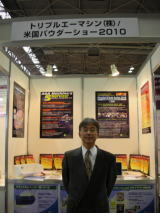 AAAmachine, Inc. introduced Powder Bulk Solids (magazine) as well as Powder & Bulk Solids 2012 (PTXi 2012) (trade show) to attendee and exhibitors in Japan during Powtex Osaka 2011. 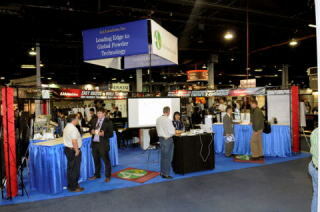 Powder & Bulk Solids - PTXi 2012 will be Jointly held with 4 major exhibitions-(1) Powder & Bulk Solids, (2) ChemProcess, (3) PharmaProcess, (4) ProcessPack (5) FoodProcess --- total 5 exhibitions on May 8-10, 2012 in Rosemont, IL USA. If you are interested in exhibiting to this trade show from outside of USA, please contact us for booth application - from $3900/100sf. AAAmachine has reserved #3525/3527 (600 sf) island booth close to the entrance of the show. Even if 100 sf space can be reserved within this island booth. Please do not miss this chance. Fujisaki Electric, Exen/Moritani, ACO, Matsubo, Nisshin Eng. 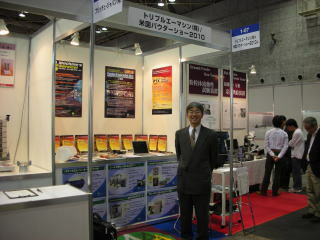 joined and shared the AAAmachine joint booth. See details. AAAmachine introduced BI-MODE (Supply-chain system) and i-BES (International Buy-Direct E-commerce service). In 2011, AAAmachine will introduce the following US powder handling equipment manufacturers at booth #2-08 (International Powder & Bulk Solids/AAAmachine booth). Gravity Tru-balance Sifter QA36, QA46 series (GREAT WESTERN Manufacturing , Leaven worth, KS USA) In-Line Tru-Balance Sifter is also available. 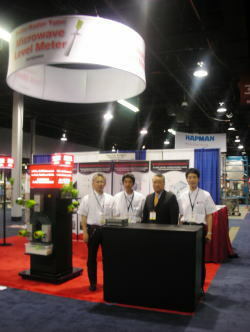 AAAmachine is marketing agent of these US companies in Japan and other foreign countries. If you have any questions or marketing inquiry, please call AAAmachine at 800-996-0070 or e-mail us.